Have you ever noticed that other gardeners always have more difficulties than you do? You mention that you have deer/rabbits/voles/Japanese beetles/shade/whatever, and then you hear how the other person has the same problem but much, much worse than you could ever imagine. I’ve noticed that it’s the same with rocks: You grumble about hitting a few rocks when digging a fencepost or trying to plant, and invariably, someone else has more/bigger/harder rocks in their garden. Well, whenever I hear someone complain about rocks in the garden, I have to think that they don’t realize how bad it could be! 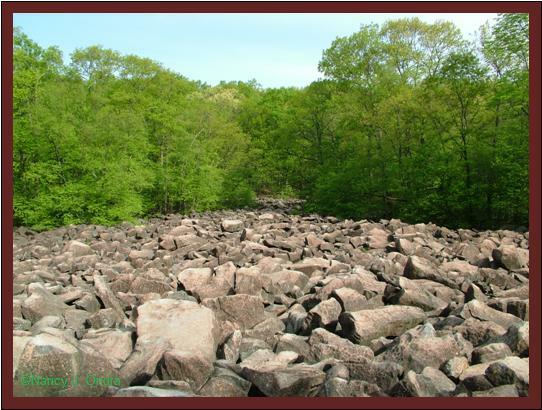 Ok, to be fair, this isn’t really a garden: It’s a 5-acre field of boulders at Ringing Rocks Park in Upper Black Eddy, Pennsylvania. There’s a lot of fascinating lore about the origins and properties of this area. It’s claimed, for instance, that no life exists among the rocks and that birds won’t fly overhead; no one told the spiders, dragonflies, and birds that, though. 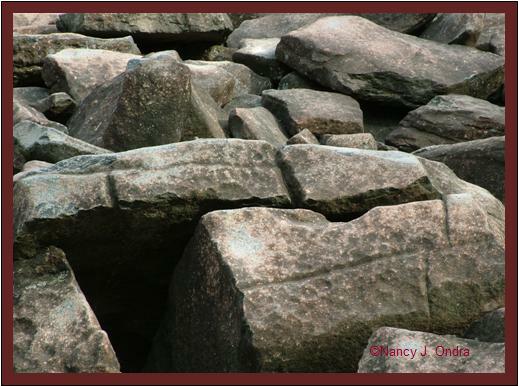 The lore does make for interesting reading, however, and if you’re interested, you can check out one report at The Ringing Rocks of Pennsylvania: A Musical Mystery along the Delaware. Even without the hype, the experience of seeing and touching these rocks is unforgettable. Their weathered surfaces are fascinating and varied. 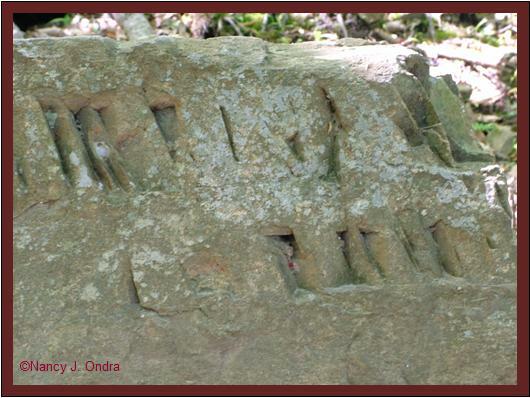 Besides the natural markings, many of the boulders display man-made markings, where they’ve been struck by hammers. As you may guess from the name of the park, these boulders have a unique property: They ring in bell-like tones. They don’t all ring, so you have to try hitting different ones to find the “ringers” and then hear the range of sounds. 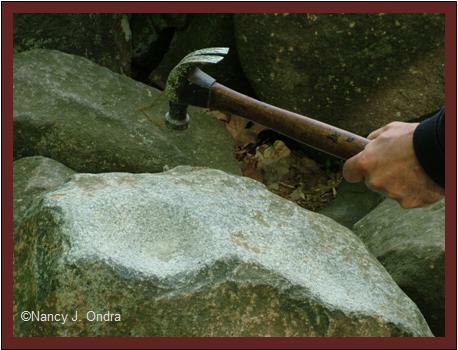 There is one visual clue to look for: The boulders with the most hammer markings tend to have the best sounds. You can find a couple of sound clips at the Avalon Foundation article mentioned above (here’s the link again). The site is quite bare in the middle, but along the edges, leaves and other organic debris gets trapped in the cracks, and you can find various sorts of seedlings getting started. There are also some beautiful lichens along the wooded edges. If you scramble down the main boulder field, you can get a great view looking back up the slope. For many people, the experience finishes there. But if you take the trail that continues past the top of the boulder field, or if you get to the bottom of the field and take the trail that leads from it, you walk through some outstanding old woodlands filled with more boulders, rushing streams, and lovely wildflowers. The main trail takes you directly to a ledge that creates a waterfall. 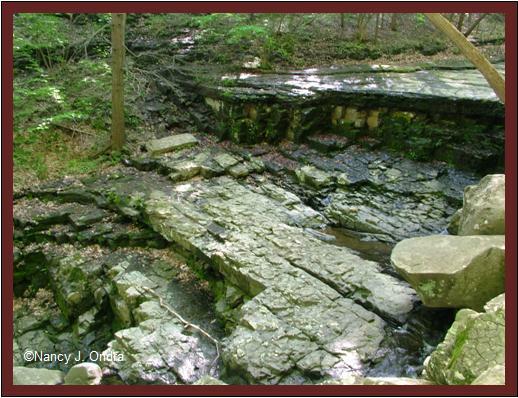 On a recent visit, a friend and I followed the lower trail and ended up coming out much lower on the streambed. 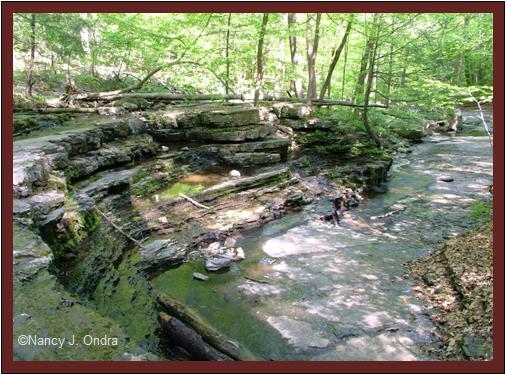 It’s been pretty dry here (until today, anyway), so we were able to hike back up directly on the streambed. There are so many amazing features, such as these little angular pools. About a half-mile up, we climbed up these step-like layers to reach the area of the main falls. 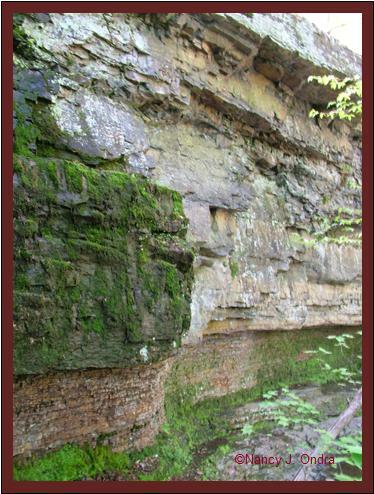 The overhanging ledges seep water and create perfect habitat for ferns, mosses, and other really cool plants. Somehow, these ledges support much larger plant life as well. Hiking back up to the parking lot, we passed some boulders with fascinating markings. The markings below looked surprisingly familiar. Our family farm is about an hour away from this area, but we happen to be part of the same geologic feature that created Ringing Rocks. Here’s one of our marked rocks. 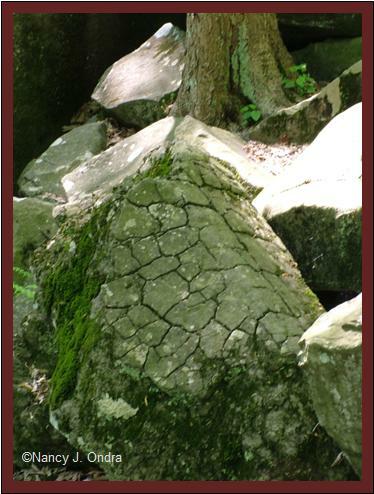 Some properties very close to us have sizeable boulders, but we mostly have much smaller rocks. 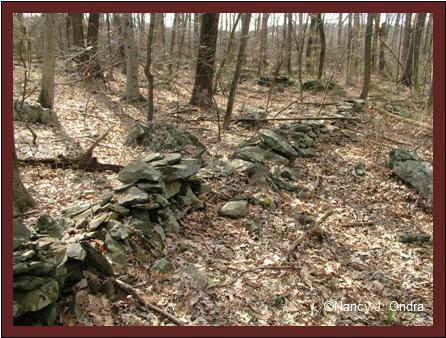 Efforts to farm some of the land in the distant past have left us the remnants of stone walls. The stones are very irregularly shaped, though, and not of much use for building. We’ve let many of the former fields go back to woods: Besides being still rocky, they tend to be very wet and poor for farming. My own field is one that had been farmed much longer and more intensively, probably because it’s slightly better drained and doesn’t have quite so many larger rocks. In fact, I mostly have piddly little fist- to football-sized stones that are pretty useless for anything. Proper stone walls are out of the question. But out of desperation – I have to do something with them – I ended up with these. Compared to Fran’s amazing stone walls shown in her post Stone: Can’t Get Enough of It over at Gardening Gone Wild, my own little rock piles seem rather pathetic. But they do have a few advantages: 1) They’re free, 2) They’re moveable, and 3) They’re expandable. You can’t get those features from many types of stonework! I just love this post Nan. The Ringing Rocks is a phenom I have never heard of. They look amazing with all the markings in the rock. I envy you your rock supply. I would be doing some of the same if I had my own supply. I live where it is sandy and not many rocks at all. If we lived nearer a strip mining operation I could collect some but as it is I just pick em up where ever we are. I have a small collection I will have to work up a post about. Not really worth mentioning. I love each one tho. Thanks, Lisa! It’s funny that you envy me my rocks; I find mine rather annoying and envy my neighbors their bigger rocks. Ah, well; better to covet rocks than other stuff, I suppose. “Found” rocks are cool too. Sadly, taking rocks from Ringing Rocks Park isn’t allowed; I sure wish I could have brought home a few of the small cubic bits from the waterfall area. I live in New Jersey not very far from Upper Black Eddy. 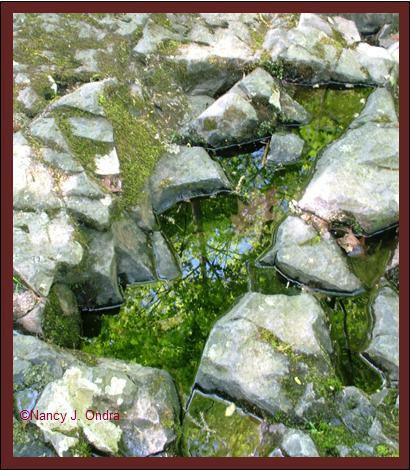 In Kingwood Township, very near the Delaware, the rocks are mostly a sedimentary stone called argillite, formed at the bottom of lake beds about 200 million years ago. I’ve noticed that many of the rocks make a metallic ringing sound when hit with a hammer. 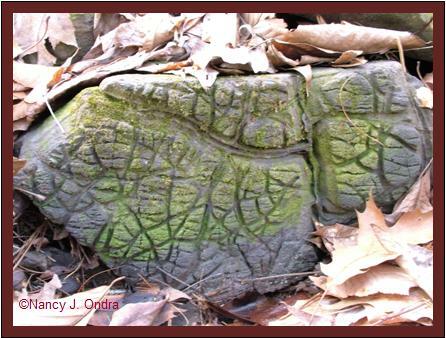 Interestingly, an old name for this stone is “blue jingle.” It would be interesting to see if the rocks at Ringing Rocks park are the same argillite formation we have in this part of New Jersey. Neat, James; I’d never head of “blue jingle.” The boulders at Ringing Rocks are an igneous rock known as diabase. I think it’s not unusual to find diabase and argillite in the same area, at least around here. 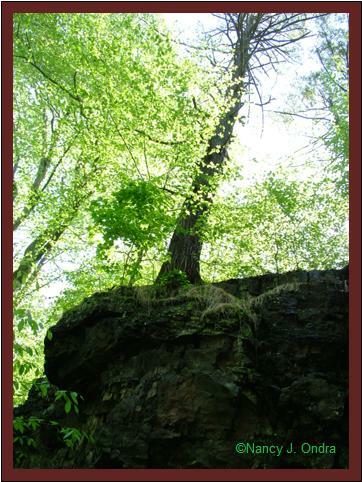 Besides the igneous intrusion, the primary geology of the RR area – if I remember correctly – is sandstone and shale. Nan, there’s something about rocks that calls to me. My dad always had a stone in his pocket, I still have rocks in my garden that he gave to me because he thought they were shaped like something unusual (like a shoe). I love to collect rocks on the beach and hold them in my hand. Now I have such an urge to go walk the beach before the summer crowds come. Our north shore here can be quite rocky. Your photos are lovely, that’s a place I could spend all day long. You’re not that far away, Melanie – maybe you could plan a weekend next spring (among all your other activities) to hit some of our great nurseries and visit RR too. How neat that you have gift rocks from your dad. That makes each one special. What an amazing place. Your photos remind me of a four day wilderness hike I did in my teens. We had to cross several boulder “fields” strewn down the sides of a mountian (probably old avalanche sites). My ankles were killing me by the end of that hike, but the scenery was *so* spectacular. Yep, climbing on rocks is a good workout, isn’t it? But fun too. Don’t be too impressed with the “polished” look of my mini-walls; the photos are from when they were just built last summer. They don’t look quite so tidy at the moment! Such a great post, Nan! (But you know about me and rocks.) I never have made it to the Ringing Rocks–shame on me! 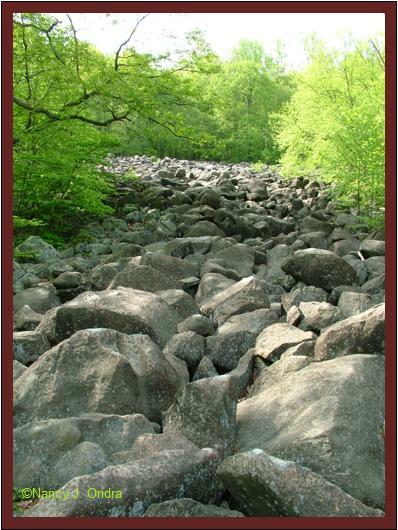 But I love the “River of Rocks” at Hawk Mountain and the glacial boulder fields around Canadensis in the Poconos. Like you, I envy friends who have real boulders on their properties–surely the ultimate lawn art! Thanks for these wonderful photos and for bringing the experience alive. Oh, heavens, you of all people really *must* go. You’d love it! What a fascinating place Nan. I love what you’ve done with the rock borders in your garden. Thanks for visiting, Linda! I’m glad you found me and enjoyed the story. Hi Nan, what a wonderful story. My husband took me to a place he called Boulder Field about an hour from Berwick when we were first married. He said the glaciers had left the rocks there, it looked something like your photo. Did OFB say Hawk Mountain??? That is one of my most favorite places. I took my girl scout troop there and we climbed to the top and ate our sack lunches while sitting on the edge of the rocks. Talk about dangerous, but we all loved it. Your rock borders look cool, I like their portability, not set in stone, so to speak. I wonder why we all have these common threads connecting us ? Hi there, Joy. 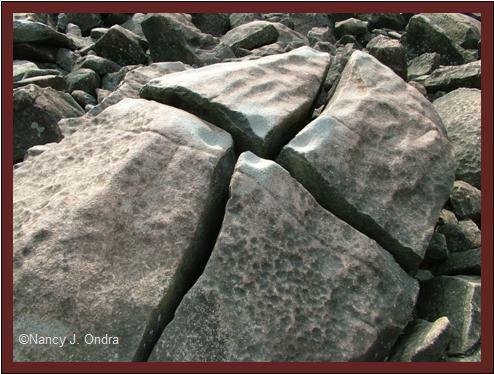 It was thanks to geology class in college that I found out about Ringing Rocks. You’re right: An appreciation for stone does seem to be a common link for many gardeners. At least, we appreciate rocks as long as they are not where we want to dig! It’s a deal: You pay for shipping, and I’ll send you as many rocks as you want! Ringing rocks. How neat would that be? I wonder how they got that way. I can completely identify with you envying your neighbor’s rocks. I have oodles of rocks of my own, but I feel they are useless as well. Boulders are neater, but they would be much more difficult to move. Quite right, Cinj! What a pity that people who are blessed with good-sized rocks don’t seem inclined to trade them for large quantities of smaller rocks. That is more rocks than I have in my garden! That is a river of rocks. I need to do a post on all the rocks. I like the rocks! Ah yes, but only *slightly* more than you have, right? 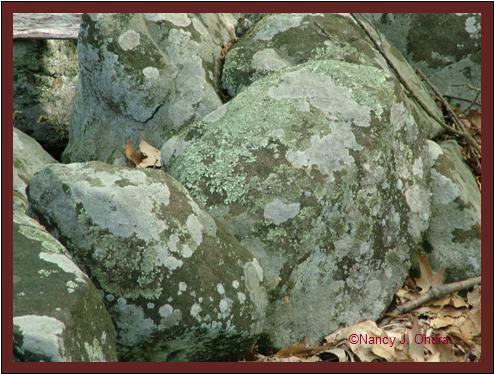 I seem to remember you did a neat post on rocks and lichens at some point last fall. But a tour of the various stone features in your garden would be great! Neat post Nan! The ringing rocks place sounds fascinating. (Pun not intended, this time.) I think your use of the rocks for your raised beds is great. I wish I had more rock in our landscape to use for that very purpose. Although they are heavy I think rocks make better raised beds for gardens than wood does. Thanks, Dave. 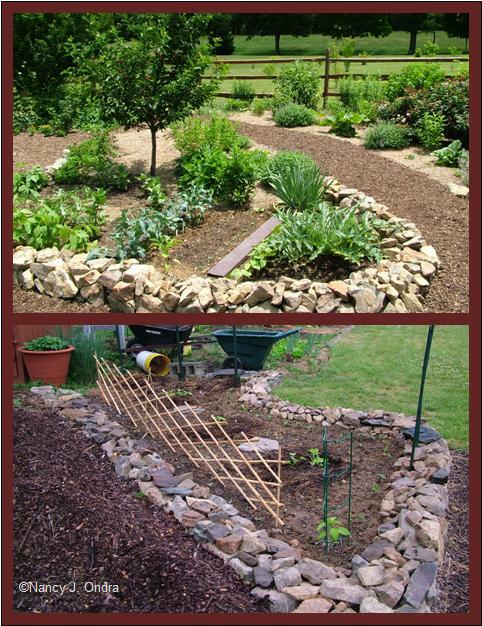 Stone does work well for raised beds, and it’s certainly longer lasting. Unfortunately, it can be *way* more expensive, unless you’re already blessed (or cursed, depending on your outlook) with lots of “native” rocks. If MMD doesn’t take me up on my offer of Pennsylvania rocks, I’d be glad to send my excess down to you! I just love rocks but we dont have non on our garden from the start, we must get them to us…phu they are havy. Hi Ken! I guess one advantage of your case is that you get to pick very special rocks for your garden. They’re certainly worth the effort! Very interesting. And yes, you’re right. We gardeners tend to commiserate with a unconscious one-upmanship. I might join in grousing about my rocks but thanks to you, now I have some perspective. Why, compared with the ringing rocks, I hardly have any rocks at all. And like you, I use the rocks I dig out to line beds. So it’s not all negative. Hi, mss! Yep, it’s all relative, as they say. Still, even a small rock can cause a big headache if it’s in the wrong place (where one needs to dig, for instance). What a cool place! I’d love to go for a hike across the rocks and through the woodlands. Must email my mom and dad with a link to your post – maybe they’ll make a pit stop on their way south in the fall. They’d love to try to make the rocks ring and I would imagine there are geocaches hidden among them just waiting to be found. Your rock borders/walls are far from pathetic! You’ve done just what I would do. When life hands you rocks, you use them in the garden. Thanks for your comment, Cathy. I’d bet you’re right about the geocaches; it would be a perfect place for them.